Smash gets even better with latest update. Nintendo continues the deluge of new content promised at E3 with today's update. Nintendo's support of its games lately has been astounded, and when updates would have ran dry for most games months ago, Super Smash Bros. is still serving up fresh new features and items for players to enjoy. In the way of free content, you can now get an absolutely adorable KK Slider costume for your Mii Fighter. There are also new tournament modes. Community tournaments are now available that allow fighters to go head-to-head and vie to earn the most points in a certain amount of time. There are also new Regular Tournaments that will be held at specific times and adhere to the classic elimination style play. Do particularly well in a bout? You can now post replay videos of saved matches on your YouTube account so fans around the world can share in your triumph! A hoodie with the SSB logo for all Mii fighter types. A bear suit set so you can be the most adorable fighter ever. The King K. Rool set will let you be the doppelganger of Donkey Kong's greatest nemesis. The Flying Man set gives you a cool red and yellow outfit straight out of EarthBound. The Chrom Set has you taking the mantle of Ylissean royalty from Fire Emblem Awakening. The Black Knight Set for Mii swordfighters is the perfect countermeasure for those in the Bear Suit. 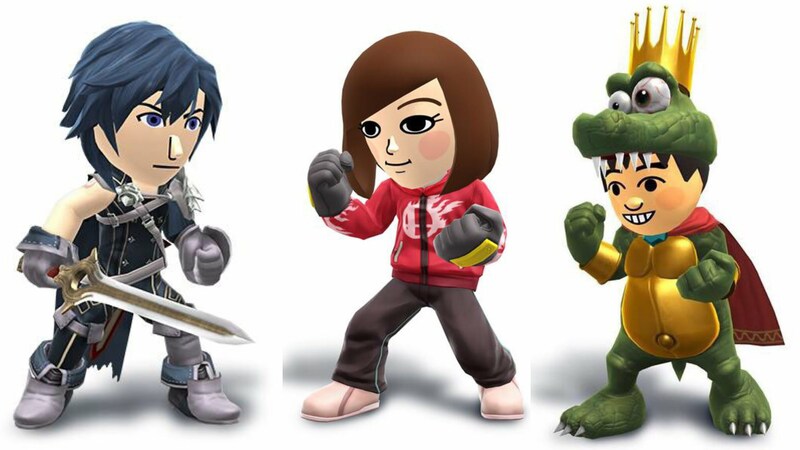 The Lloyd Set brings the Tales series to Super Smash Bros. and will have you looking like Lloyd Irving. Samus's Armor is the perfect compliment to the already available Samus's Helmet. Peach's Castle and Hyrule Castle are available in their Nintendo 64 versions for a nostalgic good time. All of these items can be purchased individually, or in a bundle for added savings.